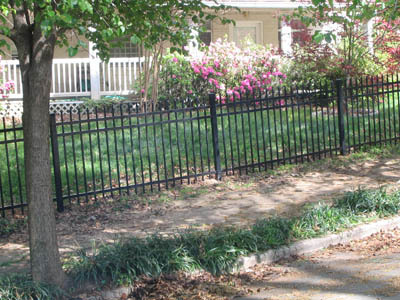 Welcome to Just Fences, Inc., a Marietta Ga based company serving the Atlanta, GA metro area in commercial fencing and residential fencing for over 20 years. We are the first fence company you should call for all your fencing needs. In offering all types of fences, we focus our efforts in bringing you the best workmanship and quality of fences available in this area. Our technicians are highly trained and background checked to assure you the highest quality fence in a safe working environment. Operating in East Cobb, Cobb County, Fulton County, North Fulton County, Gwinnett, Dekalb, Douglas, Clayton, Forsyth, Fayette, Cherokee, Hall, Paulding, Rockdale, Coweta, Henry, and more. Our vast selection of commercial fences and residential fences includes all types of wood fences, chainlink fences, decorative metal fences, split rail fences, pool enclosure fencing, pasture fencing, tennis court fence, vinyl fencing, arbors, and more. We offer all services necessary in the process of erecting a fence from beginning to end. That includes measurements, consultation, free estimates, Homeowner Association proposals, utility checks, string line, tear out, brush removal, and finally constructing the fence itself. With our highly trained hands on technicians and the best fence warranty available, you can be assured that by choosing our company you will receive the highest quality guaranteed workmanship needed in supplying you with a fence you will be totally satisfied with for years to come. You will definitely get a superior fence. So, if you need a fence, please call now for a free estimate! Just Fences, Inc. will take care of all your fencing needs! Please feel free to browse our vast selection of products and services available to you and see our actual work.